LOUISVILLE, KENTUCKY — Visually Impaired Preschool Services was recently awarded a generous monetary gift from Irving Materials, Inc. (imi) and their interstate, highway, and road construction division E&B Paving. 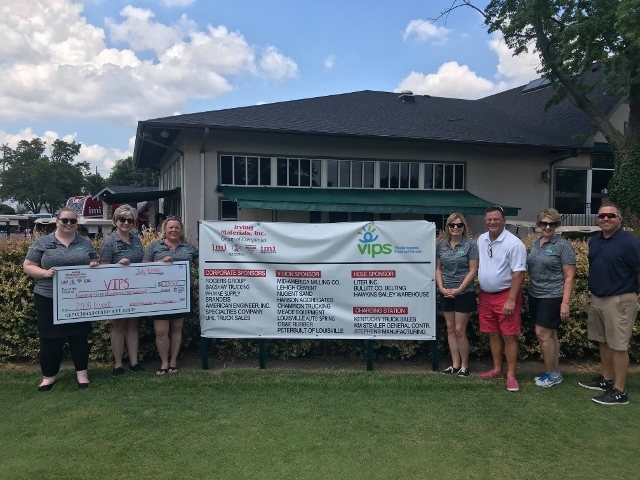 The money raised by imi and their many sponsors at the inaugural imi ‘Swing for VIPS’ Golf Tournament was held at the Louisville Audubon Country Club on July 9. “VIPS is incredibly grateful for the generosity of Mr. Ron Wibbels and the team at imi, along with their many sponsors, in raising money for our kids,” said Diane Nelson, Executive Director of VIPS. This grant will help VIPS provide a portion of a teacher’s salary, key to the direct services to those children birth to 5 years old with low or no vision in Kentucky and Indiana. This gift allows VIPS to employ the exceptional teachers who educate our children throughout Kentucky and Indiana. imi has already secured Audubon for July 9, 2019 for their next tournament and VIPS has been named as the recipient of those proceeds. VIPS, founded in 1985, is a unique charitable organization dedicated to meeting the critical early intervention needs of infants, toddlers, and preschoolers who are blind or visually impaired and to their families. VIPS served over 600 children this past year across Kentucky and Indiana and is nationally recognized as a leader in the field of visual impairment. Our Kids Town Preschool at VIPS’ campus hosts visitors from around the world wanting to learn more about our Expanded Core Curriculum and best practices. Kids Town Preschool, a Kentucky 5-Star Center, is a test site for American Printing House for Blind’s new research and materials and is accredited nationally by AdvancED. VIPS was also recently awarded the coveted 4-Star rating by Charity Navigator for demonstrating strong financial health and commitment to accountability and transparency.